Every dog owner has gone through it. You get your beloved best friend in the car and they can’t contain their excitement. What adventure are you guys going on today? However, the jubilation quickly fades away as you pull into our animal hospital and their memories suddenly come flooding back and their tail goes between their legs. You’re visiting the veterinarian! Maybe you’re lucky enough to have a dog that has no fear and enjoys going to the vet, but for the majority of us, getting our dogs through the door becomes a chore, and then we have to keep them calm the entire time! Don’t worry, it doesn’t hurt our feelings. 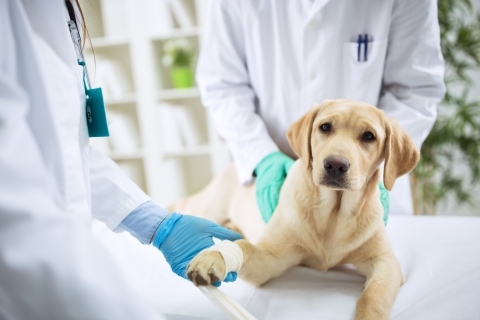 Our veterinarians know that most dogs don’t love being poked and prodded, after all, dogs don’t understand that it’s all to ensure that they’re in good health. While they may never love coming to see us at our animal hospital in Tulsa, there are a few things that you can do to make the trips a little more tolerable, for you and for your dog. If you have any questions or would like to schedule an appointment today, go ahead and reach out to us! What does your dog like more than scrumptious dog treats? Not much, that’s for sure! When you come in to see one of our veterinarians, be sure to bring their favorite treats! This will help them focus on something else aside from what’s going on behind that scary door, and will also let them know that they are a really good boy/girl for visiting the vet! The same goes for their favorite possessions. Whether it’s their favorite toy or maybe they have a blankie that is special to them, anything that helps comfort them will go a long way in easing their fear and stress. If you forget their treats, no big deal! We’ve got plenty of treats at our office that your dog will thoroughly enjoy! We hope you do this anyway, but make sure to keep bringing them in! Whether it’s for grooming, exams, or to clean up their teeth, the more often you come the more associated they’ll be with the animal clinic and realize that it’s really not that bad! Also, if your dog is extra apprehensive about seeing the vet, give us a call ahead of time! You can let us know about your dog’s specific quirks, and we can be ready to help them be as comfortable as possible during their visit. It doesn’t always have to be an exam for you to come by! If you’re really working on getting your dog accustomed to our animal hospital, then bring them by just to say hello! Our staff will happily provide them with treats and some love during your quick stop, and your dog will realize that it’s not such a bad place to be and will be more confident the next time you have to come in for one of our veterinary services! 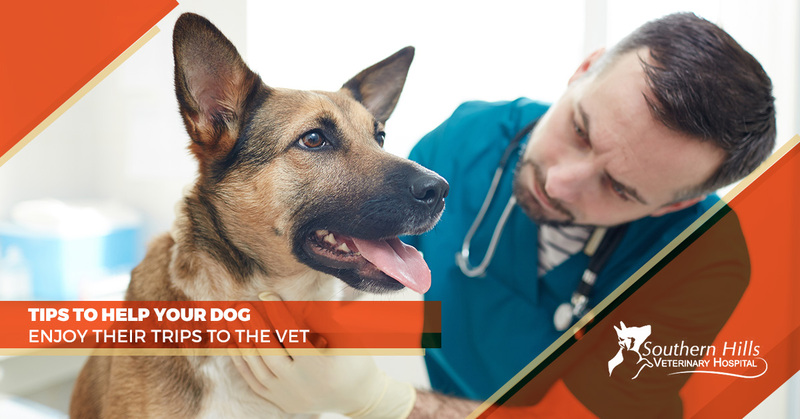 It’s important for your dog to have a connection with their veterinarian and at Southern Hills Veterinary Hospital in Tulsa, you’re in luck. Not just our veterinarians, but our entire staff works in this industry because of our love and passion for animals. No matter which vet you see, you can rest assured that your dog’s comfort and their overall health is a priority. If you’re new to our animal clinic, you’ll quickly realize that your dog is the best hands possible! If you’d like more information about our animal clinic, contact us today or go ahead and schedule your appointment now! We look forward to seeing you and your incredible dog (even if they’re not excited)!